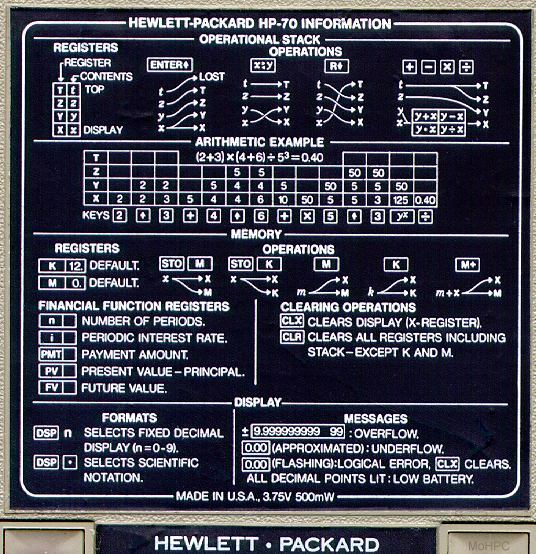 The HP-70 was a lower end business calculator designed to complement the HP-80. It retained the time value of money solver of its more expensive sibling but dropped, bond price and yield, sum of digits depreciation, summation and averaging, trend lines, day and date arithmetic etc. Like the HP-35, it was one of the few HPs without a shift key. 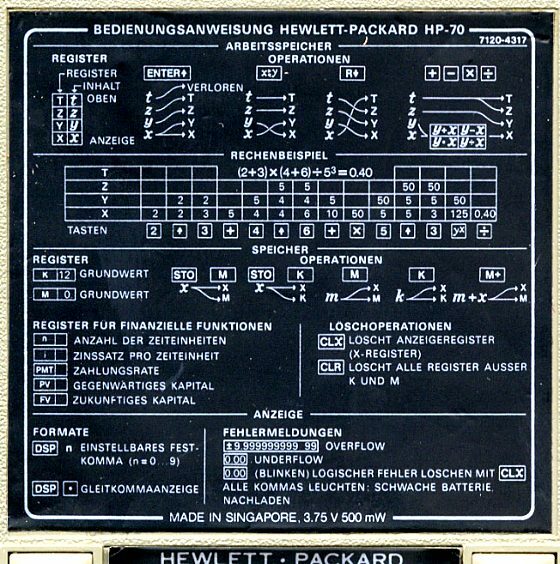 The HP-70 was superior to the HP-80 in one respect. 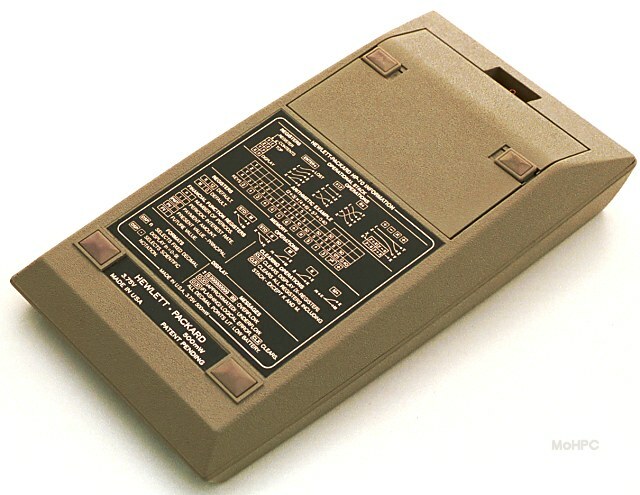 It had two memories labeled K and M. M powered up set to zero and K powered up set to 12 which is a useful constant in many business calculations. Otherwise, the two memories were the same except that M also allowed memory addition via an (M+) key but didn't provide other memory arithmetic. Storage was done by pressing STO K and STO M and to recall, M or K was pressed alone. One final point of interest: "Save" was relabeled "Enter" to match the scientific calculators. 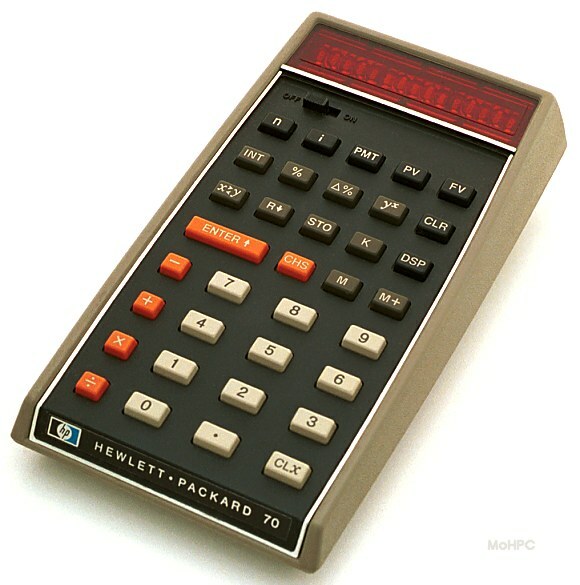 The HP-70 had a very short life. 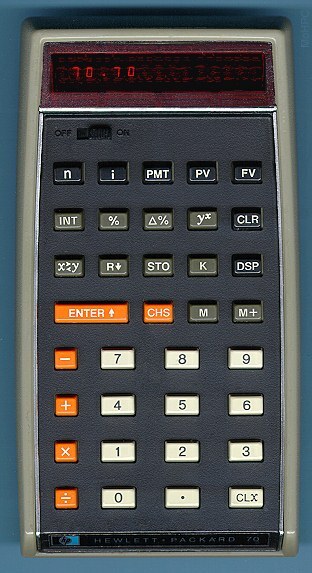 The HP-22 introduced a year later did more for less money. What some people remember most about this model was its color scheme. Its pale green/beige body with keys in black, gray, white and bold orange was quite distinctive. 'Few professions demand so much of their members as does business. Throughout history, the staggering array of personal qualities deemed necessary for success in business might have been drawn from a combination of the Discourses of Machiavelli, a biography of Albert Einstein and the Boy Scout oath, Even Aristotle warned "... he who proposes to manage any branch of economy should be naturally clever, and by choice industrious and just; for if any of these qualities be wanting, he will make mis$take$..."
20th Century business, even more demanding and fraught with peril, has tried to solve some of its problems through automation. The basic idea was good, but contributed to a new problem--most machines tend to make automatons of their users! Human beings must act as mere cogs in the machinery, must be compatible components, must not deviate from a rigid procedure at the machine's level. A business can't survive long if its principals indulge of much of this mind-deadening activity. We at HP believe machines should solve problems, not create them--that people should not become the tool of their tools. This philosophy is exemplified in your HP-70 Business Pocket Calculator--The rehumanizing machine.